I came across some problematic design-patterns of the architects of Airs’s Luminarium. 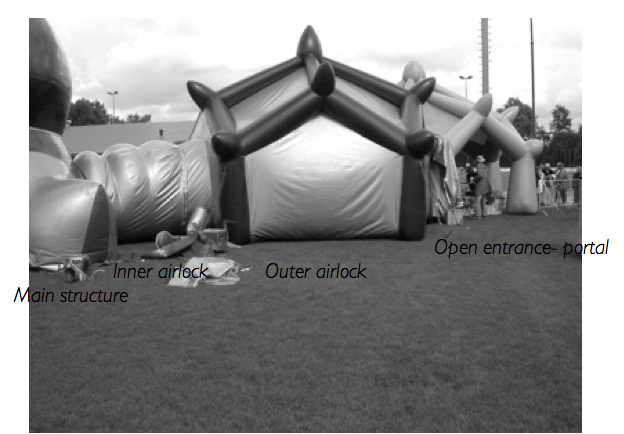 I thought its worthwhile to acknowledge the most common obstacles one comes across in inflatable structures anyhow. No solutions will be given to any design problem, but some suggestions will be given so now and then… When we are able to surpass these obstacles, these structures will be more stable and alive. adapt/prepare for local weather circumstances: A single skin inflatable can become instant hot when the sun shines, or freezing cold when not. For temperature regulation one can think of a double skin; where walls of air will have an isolation function and at the same time an acoustics isolation function. In this way the walls can as well become a part of the construction. The climate in these zones can be influenced artificially. Heat- There is always a temperature differential - it will generally be warmer inside an inflatable than outside. A temperature of 27oC/ 80oF outside could mean that inside may be uncomfortable. When it is this warm one can use water misters to spray the air. Additional strategies to deal with heat is to place the inflatable near shade if possible or cooling by air-conditioning. Or making use of materials which reflects the sunlight. Cold – One can use portable heaters and a layer of polyurethane foam beneath the structure. Or to find some sheltering of bushes for the inflatable on the north side to keep warm. There is a big potential of carbon fibers. (or bamboo, which is naturally divided into closed compartments that prevent it from buckling) which can leads to a very light structure. Buckminster Fuller bedacht tensegrity: een samentrekking van tension en integrity. De essenty van alle tensegrity constructie is, dat alle trekbelasting wordt opgenomen door een enkel continu element, bijvoorbeeld door een kabel, terwijl afzonderlijke korte dikke elementen de drukrachten voor hun rekening nemen. Het opvangen van trekbelasting heeft het voordeel ten opzichte van druk dat er minder materiaal voor nodig is. trek leidt tot rank en dun. Met kabels en stangen en met een membraan of doek (tent, ballon) zijn goede constructies temaken. Strings and fabrics are basic structuring materials which exclusively absorb tension stress, fabric is able to do this in more directions. To distribute forces they have an entire surface at their disposal instead of just one line. therefor they are ideal for creating light objects. In Festo’s Airquarium they build a steel frame, which can keep up the cloth in case that an evacuation procedure will be initiated in the event of: winds exceeding 40km/hour, power failure, structure allure or others. Make sure there are divers zips positioned throughout the structures that can be opened in case of an emergency. On can as well think of a tunnel made out of steel frame keeping up the cloth and leading you to an exit. Think of it as an organism situated within an environment which information flows from and to the surrounding environment via semi-permeable membranes. Buckminster Fuller thought of the whole context when designing. Airlocks are required at entrances to prevent loss of internal air-pressure. Examples of entrances are a revolving door, airlock portals or just zippers or Velcro. Zippers (and there also exist waterproof zippers) are easier to operate than Velcro. -An entrance via the two sheets pressed together because of the air-pressure inside. -When using a double wall construction; one doesn't need a proper door. -Festo’s airquariums airlock; a rigid tunnel-construction with on each side a door. Architects of air’s airlock; one entrances through an open entrance-portal (right) Where you can take of your shoes, then via a door flap one enters the first outer airlock (middel), both the entranceportal and the outer airlock are strechted up by high pressure poles, after the outer airlock via another flap one enters the inner airlock (tunnel left), and via a last doorflap finally in the mainstructure (on the far left). An assistent ensurse that the outer doorflaps are closed before the inner doorflap is opened. The How to make a door for your bubble from Akairways. - One way is to connect parts by short round corridor pipes as a space to extend and connect the pipes through waterproof zips. - One can prevent children sticking their fingers in the ventilator by stitching a net in the pipe-hole. A single layered material sheet, laying on grass gives a very pleasurable feeling to your feet. One can try to make a 'symbiont' - to use a buildings HVAC (Heating, Ventilation or Air Conditioning) system. The warm air leaving the building inflates and heats the membrane structure. [see 2e picture of how to design an airlock] or any other infrastructure that the inflatable is attached to as a source of power for inflation - instead of just plugging the blower into electricity, to inflate (parts of) the structure - in that way it is more energy efficient, but also the inflatable will change shape depending on the activity inside the building… Or even is it possible to get the natural wind streams direct inside the inflatables. Windy cities with high buildings or seasides can develop spots with a constant flow of high wind-speeds. Or work with green energy sources like: windmills, wind towers, scoops, solar power, kite set-ups etc. to generate energy for inflating. Or one can make use of self-inflating techniques where you wouldn't have to use electricity to inflate something. The skin maybe the biggest organ in architecture. Its that thin fleece which keeps the integrity of a space whole. You can design different kinds of qualities for the skin: a skin which is semipermeable, which determines what is in and what is out…. a skin who has a close relation with its surrounding which can adapt; get pimpels for protection against the cold or from excitement. It can change color: blue from being cold, red from being ashame or excitement, it can dry out get brown, get pocky from being polluted it can sweat, it has eyes and it can breath, and it decays nicely. One can make it responsive by integration of subtle technologies, one can look for qualities like scales in translucency or elasticity. Some materials have to be highfrequency sealed other can be glued or just stitched. Other qualities are; non static, biodegradable, lightweight, strong, resistant to tearing, self-repairing. Toxic materials aren’t that beautiful: pvc's are very toxic like many fire-retardant materials based upon PBDE or BFR are extremely toxic, which have proven to cause development disturbances. When you’re self working with it, you can feel yourself it isn't healthy. There are plastics which contain no toxics. When a material says free of….it doesn’t mean that the replacements can be worse. So just define whats in it and if its toxic or not. (can you eat it or not). One can look into microfibers, non-wovens, woven vecram (used in the space industry), coated fabrics etc. Preferable look for local materials in a circle of 100 meter, or 1km around you. What kind of materials can you find in your own area, instead of directly looking for chinese markets where they have the cool stuff…and has to travel from afar. Althought you can visit them online a physical visit is worthwhile when it comes down to materials because you simply want to touch them. Many inflatables have a very dominant smell inside. Especially the one which use pvc’s . There are aswell many plastics which adapts the smell in them, depending on what happened, they can leave you with a smell of fried oilballs, sigarettsmoke, or the smell of a chinees restaurant. And there exists odeur repelling fabrics But nylons or ETFTE are smelling–less. Some PET and silicon fabrics have aroma barrier properties. On the contrary one can think of spreading specific odeurs in the space via the ventilators. Some materials are so static; that all your hair will rise or even one can get electic shocks when touching the fabric. The spaces can leave the spectator disorientated, seemingly floating in boundless space or tumbling into unfathomable depths just by the play of light. The experience of light and colour inside inflatables can for instance purely be createdy by daylight shining through semi- translucent coloured materials - the atmosphere inside alters according to changing weather, rainfall, clouds, sun, shade of moving trees etc. The structures have been of value in attracting sectors of the community that are often excluded and have traditionally been difficult to involve, in particular the elderly and people with mobility difficulties. 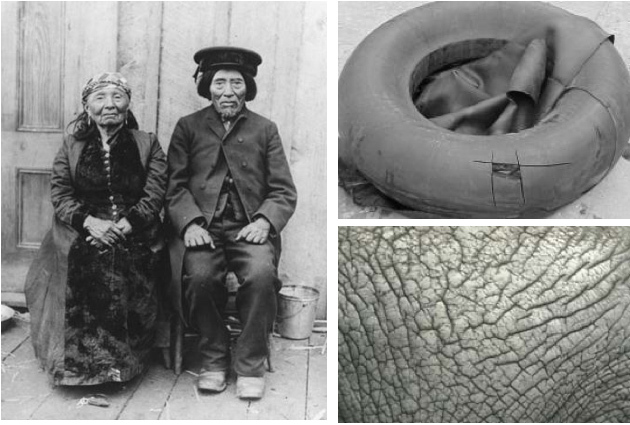 A good inflatable design can be so congruent with peoples feelings that it sustains itself- when it gets dirty or worn people take care of it themselves, because the pattern is deeply connected to their own experience. From outside, it seems as though the inflatable maintains itself almost as if by magic. It is the self-sustaining character the living inflatable has, which is the result of making something with real care. Because people enjoy being there, they look after it and even when no one else is there, you can “feel” the presence of life there, because you can sense that people are taking care of it. The character of nature can’t arise without the presence and the consiousness of death. But before they die, make sure you choose materials which decay nicely. Modern modern sculptures or architects often choose material which decay awfull. The character of nature is fluid, rough, irregular, but it will not be true, unless it is made in the knowledge that it is going to die. No matter how much the person who makes a building is able to understand the rhythm of regularity, it will mean noting so long as he creates it with the idea that it must be preserved because it is so precious. If you want to preserve a building, you will try to make it in materials which last forever. You will try to make sure that this creation can be preserved intact, in just its present state, forever. Canvas must be ruled out because it has to be replaced; tiles must be so hard that they will not crack, and set in concrete, so that they cannot move, and so the weed will not grow up to split the paving; But to reach the quality without a name, a building must be made, at least in part, of those materials which age and crumble. Soft tile and brick, soft plaster, fading caots of paint, canvas which has been bleached a little and torn by wind. Preferably is to work with biodegradable materials so after use one can feed it in the form of nutrients to the ground or to use materials which can be upcycled in a techinal cycle the cradle_to_cradle concept. One can use materials which after use can break it down in the bio cycles (like plastics made from mais), or upcycle it in a technical cycle. But it isn't always that simple; for instance one wants to use bioplastic, and the bioplastic as it is biodegradable, but when you look further and you find out that it is grown as a monoculture and erosing the grounds and pollutes the air massively by its production and which has to travel from far, then one can wonder if this is that beautiful ‘bio-degradable’ material we want. But you don’t have to be perfect right now as long there is a direction and all these materials are not all available now, but you can set your goal for 20 years, just define where you wanna go. pneumatology: Lightness as a state of being. Some problem domains in our contemporary architecture.